For someone who spent several hours lining up for tickets at Beijing Railway Station, you would expect Wang Yingzhang to be excited about returning home to Shanghai for Spring Festival. "It's freezing there," groaned the 35-year-old IT sales manager, who has enjoyed the warmth of the capital for more than seven years. "Shanghai has no citywide central heating system like Beijing, so if we don't switch on the air conditioner it is unbearable. Growing up in the north of England, I know all about freezing winds, driving rain and snowstorms. But then again, I was usually watching them all through the double-glazed windows of my warm, cozy home. "Two sweaters, a waistcoat and a down jacket; I need to wear more clothes when I'm in my parents' home than when I'm outside." Wang said he has even decided to cut his holiday short so he can return to his heated apartment. "I really want to spend time with my parents but the freezing cold - which honestly chills me to the bone - makes me count the days until I leave for Beijing," he said. Wang's feeling is shared by millions of people who live south of the Qinling Mountain-Huaihe River line, a boundary drawn by the government in the 1950s. Areas below the line, which often experience freezing temperatures in winter, do not receive central heating. China this year saw one of its worst winters in decades. Heavy snow caused chaos with the nation's transport networks, while citizens braved biting winds and frozen sidewalks. But while the majority above the Qinling Mountain-Huaihe River line had homes warmed by State-run heating plants, those below enjoyed little respite from the cold conditions. Central heating systems in North China are largely fueled by coal and gas furnaces, or by oil boilers, and the heat is transferred to surrounding buildings via a series of pipes. The plants are believed to be better for heat efficiency and pollution control. Beijing District Heating Group, the biggest in China, covers an area of more than 34 million sq m.
"In Chinese history, Qinling Mountain and Huaihe River mark the geographical north-south boundary. Most people think the north is cold and the south is warm, but that is not accurate," said Chen Zhenhong, a researcher for the Hubei provincial meteorology bureau. Humidity plays a large role in sensory temperature, he said, explaining that for every 10-percent increase in humidity, a person's natural sense of temperature drops by about 1 C.
6 C lower than what people in the north feel," he said. 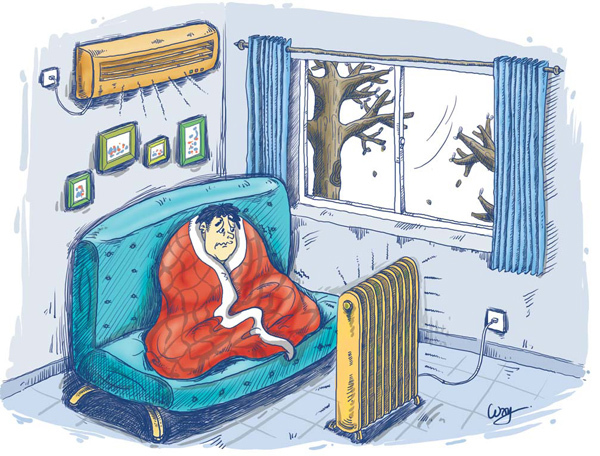 The decision in the 1950s to establish central heating only in the north was "a money-saving move because the State provided heat as part of its welfare package", according to Xu Guangjian, vice-president of the school of public management at Renmin University of China. "Housing and heat was free until the housing reform started in the 1980s. Although free heating ended, the north-south divide remained," he said. If Confucius and Lao Tzu, the two most famous philosophers from the Chinese history, were to have a fight, which one would you cheer for?